After a lot of searching, I found my master copy of The Grimoire #1. 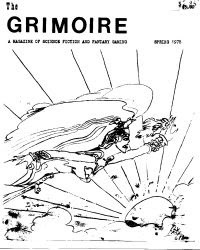 In late 1977, I decided to produce my own gaming fanzine, The Grimoire: A Magazine of Science Fiction and Fantasy Gaming. As it would have to be reproduced by photocopy — and photocopies were very expensive in San Antonio at the time — it was typed on legal size paper which was cut in half so two pages could be printed for the price of one legal-sized photocopy. Each page was hand-typed on a manual typewriter. It took forever to produce. It was finally ready to print in the Spring of 1978, so Volume 1, Number 1 of The Grimoire had a publication date of Spring 1978. The first issue was 30 half-legal-sized pages. It contained a wide variety of material for D&D and boardgames. It even had a couple of pieces of artwork drawn by a friend who I played Stellar Conquest with. These were pasted to the page with rubber cement. The zine started off with a table of contents and my editorial. The editorial, naturally, talked about my plans for the fanzine. Next up was a one page article “Divine Intervention in D&D” which presented a system similar to the one in Empire of the Petal Throne for determining whether a D&D character’s cries for help were hear and answered by the character’s deity. The system was obviously intended to be used with Gods, Demi-Gods, and Heroes as there were tables for gods with more than 175 hit points and for gods with 175 hit points or less. Sacrificing magic items really increased your chances of success. This was followed by an article entitled “Terraforming and System Reshaping in Stellar Conquest. This 1.5 page article provided rules for very high technology in Metagaming’s then popular game that would allow players to terraform planets and even create ringworlds. Yes, we actually used these rules. After Stellar Conquest was the “Minidungeon Feature,” The Tomb of Lord Advandey. In this small hill tomb housed the remains of Lord Advandey and — according to legend — his gem-encrusted rod of solid gold. A small dungeon but with a nasty surprise. The minidungeon was followed by “New Independents for White Bear & Red Moon: The Oathbreakers.” This was a tribe who had sworn allegiance to the Red Emperor, but refused to serve and were cursed to an undead existence. Next was the major article for this issue, six and a half pages on “Demon Conjuration in D&D.” This article gave a fairly complex demon summoning system for D&D based very loosely on medieval texts and heavily influenced by the SPI pocket game “Demons.” Had this be published in a publication with better distribution, this article would have given the fundies a lot more ammo for their anti-D&D fears of the early 1980s. One of my players wrote a BASIC program for generating hex paper. We published it. This was probably one of the earliest published computer GM aids. A short article on “Spell Points for D&D” and a large illo filled up blank space on the two pages of program listing. A few short pieces rounded out the issue: Rules for a thief character for the TSR Dungeon! boardgame, a couple of scenarios for Metagaming’s Warpwar, the start of a play-by-mail D&D game, a Lensman find-a-word, and some feedback questions. About 30 copies were printed. Players in my campaign and authors got free copies, the rest were sold at Aggiecon and at Dibbles Hobby Shop in San Antonio. Cover price was $3.00 which just covered the cost of printing. I haven’t seen a copy since 1980, I doubt many survive. I don’t have a copy other than my typed master. To get access to a download of The Grimoire #1 (as well as other special RetroRoleplaying Cancer Fund downloads), send a donation in any amount — small or large — to me via Paypal. My apologies for having to ask for donations and my heartfelt thanks to everyone who donates. If you cannot donate but wish to help, please spread the word about my request and offer. Thank you very much in advance.